A WOMAN drowned in a flash flood in Negros Oriental, while a 12-year-old girl suffered injuries in Siquijor as tropical depression Basyang swept across southern communities in Central Visayas. 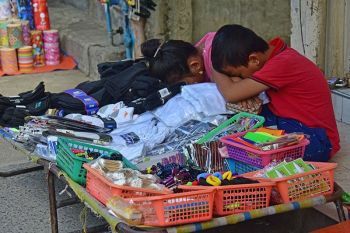 In Cebu, at least 1,560 passengers were stranded after the Coast Guard prohibited 271 vessels, more than half of them cargo ships, from sailing. The Coast Guard also rescued 15 Chinese nationals in Getafe, Bohol, hours after they were stranded in Cabul-an Island of Buenavista town when the motor banca they had rented suffered engine trouble. In Cebu City, parts of eight barangays reported power cuts after Basyang’s gusts brought down some lines. Areas affected were in Busay, Babag, Bonbon, Tabunan, Tinago, Buhisan, Toong, Pamutan, as well as Forest Hills and White Hills. At least 109 families or some 300 persons were also evacuated in Alegria, Argao, Boljoon, Ginatilan, and Sibonga, according to an initial report from the Provincial Disaster Risk Reduction and Management Office (PDRRMO). Basyang made landfall over Dumaguete City before 11 p.m. Tuesday and was on track to reach Palawan by tonight and leave the Philippine Area of Responsibility on Thursday afternoon. Waves were estimated to swell as high as four meters, the weather bureau Pagasa said. It also told residents of Palawan and the Visayas to expect moderate to heavy rains all throughout Valentine’s Day and Ash Wednesday. Gaudiosa Lania, 71, drowned in Barangay Trinidad, Guihulngan City around 8 a.m. Tuesday after a flash flood hit a creek. Police said that her body was found past 3 a.m. in the same village. About five hours before that, Jhena Mae Balos, 12, suffered injuries after a coconut tree fell on her family’s house in Barangay Cang-inte, Siquijor town in Siquijor Province. Her father brought her to the provincial hospital. Rain drenched most of Cebu for most of Tuesday, even as Basyang weakened from a cyclone to a tropical depression. Since 8 a.m. Monday, however, the Coast Guard has suspended boat trips after Signal No. 1 was raised over all of Central Visayas and parts of Northern Mindanao. Commander Jerome Cayabyab of the Cebu Station said that the Coast Guard will allow vessels to leave the port only after Pagasa lifts the storm warning signals. Despite warnings, an undocumented motor banca left Bohol for Cebu at 2:30 p.m. yesterday. It encountered engine trouble upon reaching Cabul-an Island of Buenavista town at 4 p.m.
Ensign Nigel Pia, deputy commander of the Coast Guard in Tagbilaran, confirmed that a team from Getafe rescued the crew and 15 Chinese passengers. “They are all safe now and will be ferried to Cebu once Pagasa will lift the storm signal,” Pia said. As of last night, power was back in Buhisan, Toong, Pamutan, Forest Hills and White Hills in Cebu City. 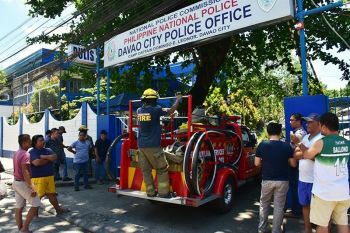 A day after securing President Rodrigo Duterte during his visit to Cebu, the Police Regional Office (PRO) 7 had another busier day than usual, with officers evacuating families whose houses were submerged in flood in Candijay, Bohol yesterday morning. Senior Supt. Julian Entoma, PRO 7’s operations and plans division chief, said 27 families were evacuated. Entoma said that the region’s police force remained on full alert and were deployed to monitor rivers, coastal villages and seaports, like the one in Santander town, the southernmost part of Cebu. Three persons went missing after a motorized boat capsized in the seawaters between Manjuyod and Bais City in Negros Oriental. Entoma said that a search team was deployed. 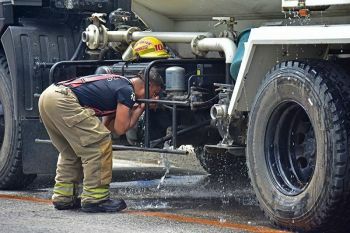 According to Rafael Luche, PDRRMO Emergency Rescue head, the Province had positioned their teams in the southwest side of Cebu to keep an eye on flood-prone areas in Rhonda, Alcantara, and Moalboal.